There’s nothing like classic Italian food and traditional recipes. We’re talking gooey pasta, cheesy pizza, savory sauces, and so much more. It’s meant for sharing, enjoying, and celebrating the moments that matter most with family and friends. No matter who you are, you’ll find comfort in a bowl of spaghetti and meatballs at the end of a long day. Let’s dive into the top 5 classic Italian dishes we love to eat. Of course, when we think of classic Italian dishes, we can’t help but think of spaghetti. Remember the first time someone made you spaghetti and meatballs? If not from memory, than of your parents taking photos as you smeared it all over your face. It’s not hard to cook and it’s delicious to eat. It can be so flavorful and satisfying too. In fact, we plan to cook and share spaghetti and meatballs until the end of time. Although, America gets the credit for topping it with meatballs. Still a classic comfort food. Come in and try out made for scratch potato dumplings. It’s our Neapolitan family recipe that is made fresh daily. Gnocchi is a traditional type of pasta. It is typically small, thick, and soft dough dumplings made with various ingredients, like potatoes or cheese. Not to mention, Gnocchi sauce variations are diverse too, such as creamy gorgonzola, meat sauce, tradizionali tomato, and caprese oven-roasted sauce. Gnocchi may be eaten as a first course (as an alternative to soups or pasta) or it can serve as an entree. If you haven’t tried it, you are missing out. What gets better than layered pasta, cheese, and meat sauce? The hearty Italian dish is even better when cooked with homemade noodles and fresh tomato sauce. It’s comfort food at it’s finest. Match up with a nice salad and some garlic bread and we are in pasta heaven. Overall, the only pitfall is waiting for it to cool down before digging in. Who doesn’t love a good pizza? Protein meets pasta in this fulfilling Italian dish. Chicken and Eggplant Parmesan are both rich, seasoned, and delicious entrees. The flash fried eggplant, or chicken if you prefer, layers baked with tomato sauce and mozzarella, and comes topped with a pile of spaghetti. We’ll take two, please. The variations of pizza are endless, but Margherita pizza is quintessential Italian food. The simple, yet delicious pizza features mozzarella cheese, basil, olive oil, and tomato. Besides, the moment those flavors hit your palate, you will be hooked for good. It’s no wonder that Margherita Pizza is a staple in every pizza shop in Naples. Although, in America, we take pizza to a whole different realm with endless possibilities of toppings. At Spizzico, you can choose from pepperoni, sausage, ham, bacon, mushrooms, onions, mixed peppers, Kalamata olives, pineapple, broccoli, spinach, artichokes, tomatoes, grilled eggplant, anchovies, cherry peppers, prosciutto, fresh mozzarella, soppressata, smoked mozzarella, and ricotta. 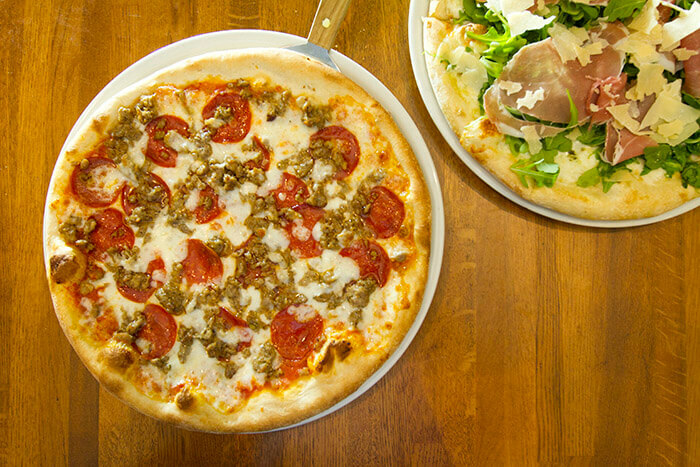 If we’ve got you craving classic Italian dishes now, Spizzico’s can take care of that. We take pride in serving quality Italian cuisine every single day. So, stop by for lunch or dinner and taste the flavors of Italy.